2. Land Exchange – Blanco County – 300 Acres for the Pedernales Falls State Park Conservation Project – Request Permission to begin the Public Notice and Input Process. I. Executive Summary: Executive Director Carter Smith will briefly update the Commission on the status of the agency’s efforts to implement the Land and Water Resources Conservation and Recreation Plan (the “Plan”). II. Discussion: In 2001, the 77th Texas Legislature directed that the Texas Parks and Wildlife Department (TPWD) develop a Land and Water Resources Conservation and Recreation Plan (Tex. Park & Wild. Code §11.104). In 2002, the Texas Parks and Wildlife Commission (the Commission) adopted the first Plan. A revised Plan was adopted by the Commission in January 2005. In November 2009, the Commission approved a new Plan effective January 1, 2010. The 2010 Plan is available on the TPWD web site. Executive Director Carter Smith will update the Conservation Committee on TPWD’s recent progress in achieving the Plan’s goals, objectives and deliverables as they relate to the Conservation Committee. I. Executive Summary: Staff will brief the TPW Commission on a proposal to increase conservation and viewshed protection at Pedernales Falls State Park. II. Discussion: The 5,212-acre Pedernales Falls State Park in Blanco County was acquired in 1970 to protect and provide recreational access to a dramatic segment of the Pedernales River, including the spectacular Pedernales Falls. The aesthetic integrity of the falls is threatened, however, by the fact that the opposite bank of the river is privately owned. As roads and utilities have improved access to the river from the north, riverfront home sites have become especially desirable and valuable. County Road 2766 bisects the park, severing the southernmost 320± acres from the rest of the park, and effectively isolating the severed tract from public access. In 2004, the Texas General Land Office (GLO) declared the property to be “underutilized” and recommended its sale, a recommendation with which the Office of the Governor concurred. In 2006, the GLO agreed with Texas Parks and Wildlife (TPWD) that creation of a Conservation Bank on this tract for recovery of the federally-listed Golden Cheeked Warbler, would constitute a “highest and best use” for the property and prevent its sale. Staff worked with the U.S. Fish and Wildlife Service for three years on development of conservation banking instruments, and in 2009 decided that permitting the bank would proceed most efficiently with professional assistance. In 2010, TPWD published a Request for Proposals (RFP) which elicited two proposals for creation of the proposed conservation bank. 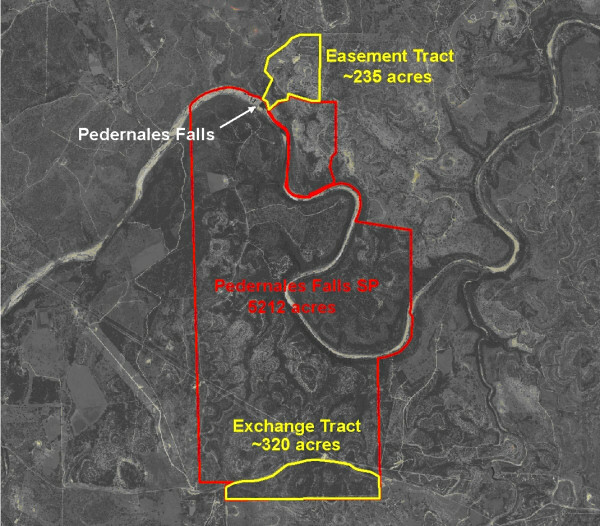 A proposal from Pedernales Blue Hole Ltd. (PBH), if successful, would result in the exchange of the 320-acre TPWD tract, encumbered by the Conservation Bank Agreement and a conservation easement, for a viewshed easement on a 235-acre ranch with river frontage at the falls opposite the park. Staff requests permission to begin the public notice and input process, and anticipates returning to the TPW Commission at some point with an action item to close the transaction, predicated on establishment of the conservation bank, which could take up to two years. I. Executive Summary: Staff will brief the Commission on the opportunity to purchase 400± acres from a willing seller for addition to the W.A. “Pat Murphy Unit of the Gene Howe Wildlife Management Area (WMA). II. Discussion: The 889-acre W.A. “Pat” Murphy Unit is located in the northern rolling plains of Lipscomb County in the extreme northeast corner of the Texas Panhandle. The habitat is primarily native prairie and is suitable for pronghorn antelope and lesser prairie chicken. The tract is “L” shaped. The owner of the 400-acre tract that would make the unit rectangular in shape is willing to sell to Texas Parks and Wildlife Department (TPWD) at or below appraised value. The habitat on the subject 400-acre tract is comparable to that on the unit, and would add both biological and operational value to the WMA. Staff requests permission to begin the public notice and input process. I. Executive Summary: Texas Parks and Wildlife Department (TPWD) is in negotiations with a private landowner for the acquisition of a 10 acre tract as an addition to McKinney Falls State Park. II. Discussion: TPWD staff is currently in negotiations with a private landowner for the acquisition of an approximate 10-acre tract of land (Tract) adjacent to the south eastern boundary of McKinney Falls State Park (Park) having 2000’ of common boundary, 200’ of Onion Creek frontage and approximately 1500’ feet of McKinney Falls Parkway frontage. 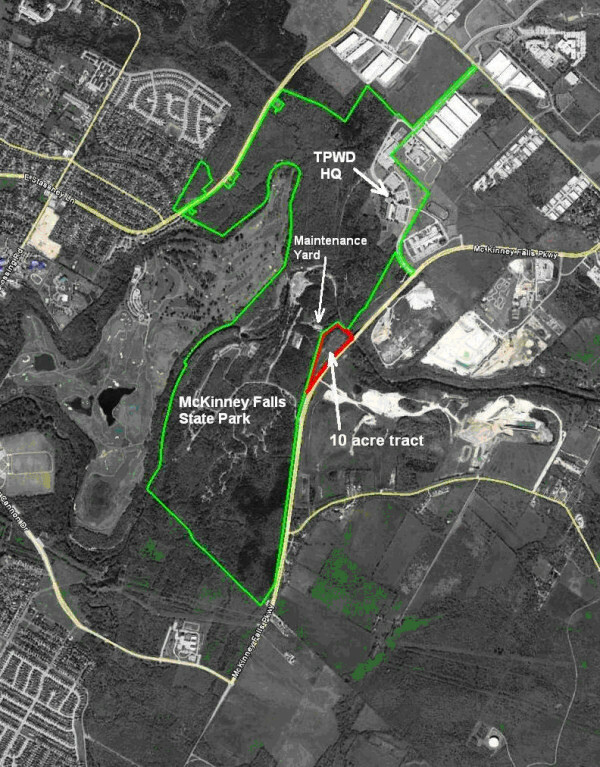 The Tract is located just to the northeast of the Park entrance and is wedged between the Park boundary and McKinney Falls Parkway. Acquisition will protect the Park entrance area from any development. Staff would like to begin the process of providing public notice and obtaining public input regarding a proposed acquisition of an approximate 10 acre tract as an addition to McKinney Falls State Park. I. 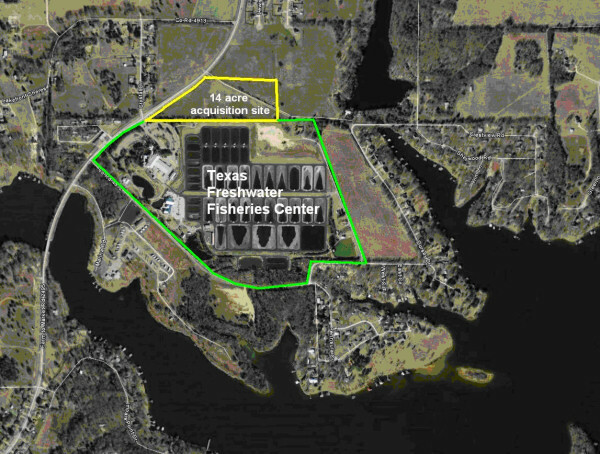 Executive Summary: Texas Parks and Wildlife Department (TPWD) is in negotiations with a private landowner for the acquisition of a 14 acre tract as an addition to the Texas Freshwater Fisheries Center, Athens, Texas. II. Discussion: TPWD staff is currently in negotiations with a private landowner for the acquisition of an approximate 14-acre tract of land (Tract) adjacent to the north boundary of the Texas Freshwater Fisheries Center, having 1500’ of common boundary. The acquisition of this Tract will be used to build a small reservoir that will hold an emergency supply of water with the capability of gravity flow to existing ponds and also the possibility of adding additional ponds. Staff would like to begin the process of providing public notice and obtaining public input regarding a proposed acquisition of an approximate 14 acre tract as an addition to Texas Freshwater Fisheries Center, Athens, Texas. I. Executive Summary: Staff continues to evaluate a land project in Val Verde County.